The City Music Foundation (CMF) provides support, coaching and mentoring for a group of young artists each year, enabling them to develop their skills in the wider music business. 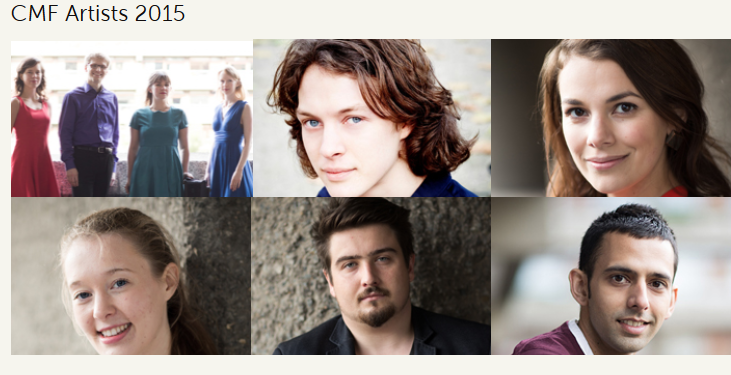 The 2015 City Music Foundation Artists are Alexander Soares, piano, Andrey Lebedev, guitar, Bartosz Glowacki, accordion, Emma Halnan, flute, the Gildas Quartet, string quartet and Raphaela Papadakis, soprano. The programme is about more than the opportunities for live performance offered, the young artists have begun working with senior business people as personal mentors through collaborations with City firms, and are attending professional development workshops and seminars, and will be working to develop promotional tools (such as a website, photography, recordings or video) with funding and expertise from CMF, and will be developing a bespoke musical project to help them created a unique nice and selling point.